Claim up to €/$/£850 welcoming bonus Play Now! Microgaming was ahead of the game back in October 2003, when the software provider released the Thunderstruck slot. And that is because Microgaming themed this slot on Norse mythology, which tells amazing tales of characters like Odin, Loki, and Thor, who of course went on to become a star in the Marvel Cinematic Universe. When it comes to the visuals, Thunderstruck presents a colourful cartoon palette that can be experienced on desktop or mobile at participating Microgaming casinos online. Having opted for the cartoon style, Microgaming has ensured that Thunderstruck still looks and feels goods to play years later in the present. The next noteworthy aspect of the design would be that Thunderstruck comes with five reels and three rows, thus providing players with a familiar setup. In addition, there are nine paylines that players will be given the power to adjust based on what they are comfortable wagering. By activating all nine paylines, players will have the chance to win in every way possible. Of course, this will mean wagering more than if only one payline were active. In regard to wagering, Thunderstruck affords players the ability to assign the coin value from just €0.01, while the maximum coin quantity can be five. • Thor Wilds: the heroic Thor serves as the wild symbol and can double the entire value of winnings earned when he forms part of a payline. Five Thor symbols on the same payline will pay out 10,000x times the stake. • Ram Scatters: a couple of rams with golden horns are used as the scatter symbol. Three or more rams in view will trigger free spins. 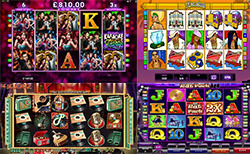 • Free spins: any winnings generated during the feature will also be tripled. Free spins can be triggered once again while the feature is still active. Thunderstruck remains a pretty solid slot game to play at Microgaming casinos. The cartoon visual style is relatively timeless and still looks fine today. More important, though, is the fact that Thunderstruck is pretty cheap to play and offers free spins plus wild winnings of up to 10,000x.